MLS to ATX #4: Does Columbus Have Any Legal Basis to Prevent MLS in Austin? This article will look at whether the State of Ohio or the City of Columbus can take legal action to prevent the Crew ‘relocating’ to Austin. What it wont address is whether there is anything morally or ethically wrong in removing an established soccer club from its home city, in order to start a new team in a new city. It has been suggested that the uproar over the Wimbledon to MK Dons move in 2004 is a good parallel to this current situation. I remember that controversy well, but I was still in Scotland when the Clydebank to Airdrie drama kicked off a few years before that. It was a huge deal and it still is. I have friends who were not even fans of either team that will forever hold a grudge against Airdrie Utd, because it was perceived that they stole a team from another town. I understand why Columbus wants to #SaveTheCrew. I get it. And I’m not going to argue against their right to protest or their right to do whatever it takes to save their team. I’m only going to look at whether there is any legal basis for them to keep the Crew in Columbus. And there is a law in Ohio that might apply. 9.67 Restrictions on owner of professional sports team that uses a tax-supported facility. (B) Gives the political subdivision in which the facility is located not less than six months’ advance notice of the owner’s intention to cease playing most of its home games at the facility and, during the six months after such notice, gives the political subdivision or any individual or group of individuals who reside in the area the opportunity to purchase the team. In December of last year, Ohio Representative Mike Duffey, asked Ohio Attorney General Mike DeWine to take legal action to keep the Crew in Columbus. Somewhat surprisingly, Dewine responded quickly to say that he had reviewed the law, and that he was prepared to take “necessary legal action” to prevent the Crew from leaving town. So we may have a legal battle brewing. A closer look at ORC §9.67. Now I’m not a licensed attorney in Ohio, but I have worked for legislatures in both Texas and in Scotland, and I am of the opinion that this is a horribly drafted piece of legislation. This means that crucial terms ORC §9.67 like “owner” or “financial assistance” or “notice” or “opportunity to purchase” are undefined, and are therefore open to conjecture. Further, there is no guidance as to how the value of the team might be determined, who gets to decide a purchase price, and whether the Crew owners have to accept it. The law remains untested by the Ohio Courts, and I was unable to find anything in the bill’s legislative history to aid in its interpretation. Putting the unworkable nature and the vagueness of the law aside, and putting aside the unusual notion of a government attempting to force the sale of private enterprise, or questions over who has standing to sue, or the inherent constitutional law and commerce clause problems, (addressed very well by Ballon D’Order here), let’s just assume that the law is applicable to the Columbus Crew and that it could be enforced. If nothing else, any initial arguments will likely be held before an Ohio judge in a Columbus courtroom. 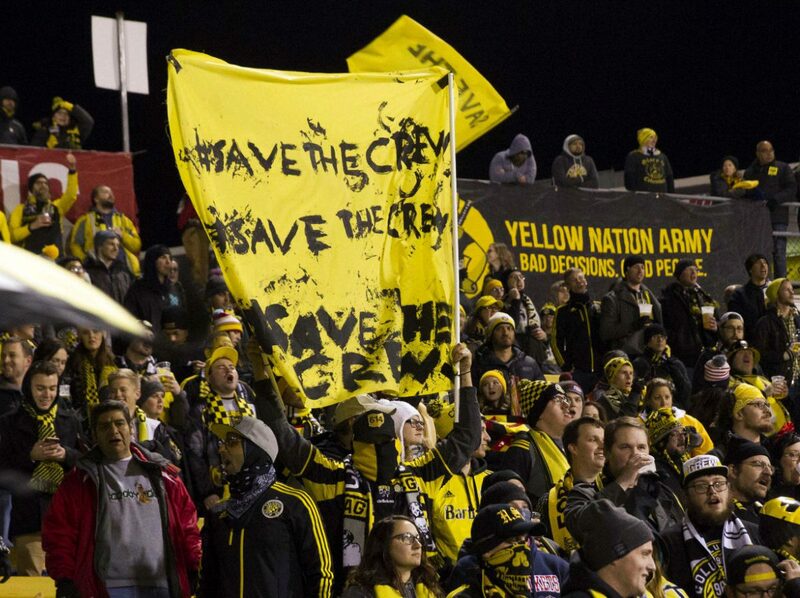 It’s not impossible that someone from the Save The Crew Group could argue that they have a right to purchase the team, and maybe they could get a preliminary injunction to delay the move to Austin, pending a lengthy legal battle. Here’s the problem. Theoretically, someone in Columbus might be able to prevent the Columbus Crew from leaving Columbus, but they wont be able to prevent Austin taking their place in MLS. Why? Because the Columbus Crew don’t have an irrevocable right to play in MLS. In other words, someone could try and buy whatever the “Columbus Crew” team is, but only Major League Soccer gets to decide whether that team plays in its league or not. What is a soccer team? It’s a simple question. What would someone in Columbus be purchasing if they successfully enforced ORC Section 9.67? The Mapfre Stadium and Lease? – OK.
It’s players? – No, see below. The team’s intellectual property, the logos, name, nicknames, colors? – Owned by MLS but for the sake of argument OK. Goodwill in the community? – OK, although everyone would agree it is diminishing quickly. The Crew history, the trophies? – OK. The staff, the front office, the back office, the youth development? – Depends on the individual contracts, but OK.
Contracts with sponsors, media, guaranteed future income? – Again depends, but OK.
An option to play in Major League Soccer in Austin, aka the “Austin Option”? – OK.
What else? Oh right, the current license to play in MLS in Columbus, let’s call it the “Columbus License”? – Fine. I could write another entire article on who actually owns each of these things, because of the single entity structure of MLS. For example, the players are all contracted centrally by MLS and are not owned by the teams. The “owners” of MLS teams are not even owners, they are referred to by MLS as ‘Investor-Operators’. Technically MLS owns the Columbus Crew. So is a potential purchaser going to sue MLS or Precourt Sports Ventures (PSV) the investor-operators of the Crew, to force a purchase? It doesn’t matter and here’s why. The “Columbus License” can be taken away from the ‘owners’ of the Columbus Crew, in an instant, by a show of hands of the MLS Board of Governors. Let me say that another way – a license for the Columbus Crew to play in MLS in 2019 could be revoked before any notice might be required under the Ohio Revised Code, and it could be replaced with a new license to field a 2019 team in Austin. In fact, this may already have happened and we would never know. So then what would the Save the Crew Group be buying if it tried to enforce ORC §9.67 ? The Mapfre Stadium lease, the Crew name, the goodwill, the trademarks, some staff….and a license to play Major League Soccer in Austin, Texas from 2019 onwards. MLS could make it even easier. MLS could vote to assign the Austin License to an entirely new group owned by Anthony Precourt, let’s call it “PSV ATX”. All of that can be done now, or whenever Precourt gives notice to MLS that he wants to be in Austin. That would be done at an unannounced private board meeting in New York, and unfortunately for Crew fans, there is nothing that Columbus or the Ohio AG can do to stop that. In short, even if the Save the Crew Group could force a sale of the Columbus Crew through this law, that team wouldn’t have any right to play in MLS. And the Group wont be able to stop MLS from granting a new license to PSV in Austin. Regardless, I would encourage Columbus and the Save the Crew Group to try and enforce ORC §9.67. The Columbus Crew should stay in Columbus. So should the logos, the trophies, the colors, and the history. This is just my opinion but I don’t think Austin wants the Columbus Crew. Austin wants a professional soccer team with no history. Austin wants a new team with new colors, new logos, a new name, and a new start. Arguably this isn’t even a ‘move’ or a ‘relocation’. It’s the end of one MLS team in Columbus, temporarily I would hope, and the start of a new MLS team in Austin. Nothing is actually being moved. Precourt doesn’t even live in Ohio. The Columbus Crew should be saved and it should stay in Columbus. It just wont be playing in Major League Soccer in 2019. And that’s basically what happened in the only other example of MLS “relocation”. Four months before the start of the 2006 MLS season, the league revoked the license of the San Jose Earthquakes and granted a new license for the ownership group to play in Houston. However the league retained the Earthquakes name, colors and logo for use by an expansion team in the Bay Area. A couple of years later, Don Garber announced that the San Jose Earthquakes would resume play as an expansion team starting in the 2008 season. However, the new team assumed all the records, logos, colors and titles of the previous franchise. San Jose fans refer to those missing years as merely a ‘hiatus’. PSV have not yet commented on whether it even intends to comply with the Ohio law and provide any formal notice to Columbus. I think it should, but obviously not until after MLS has confirmed a new MLS license for Austin, and terminated the MLS license for the Columbus Crew. Then the Crew name, history and titles could be bundled up and sold to the Save the Crew Group. Maybe MLS even adds a long-term “Columbus Option” to the remaining Columbus Crew assets – giving the Group an exclusive right to have a future MLS team in that market. And after a short hiatus, maybe the Crew return to MLS in a couple of years. Think about that for a tasty rivalry game too – Columbus Crew v Austin FC. Either way, whether you agree with it not, there is no legal basis for the State of Ohio or the City of Columbus to prevent Major League Soccer coming to Austin. Next up, the elephant in the room in Austin, or rather the Longhorn in the room. How would an Austin MLS team co-exist with the University of Texas? Do you think it could be argued that MLS technically is the owner of the Colombus Crew and that the law does not apply to them since MLS does not play most of its games in Ohio? So you truly ought to have identified much better. Howdy! Dieses Blog-Eintrag nicht geschrieben werden viel besser! Woah! Ich bin wirklich Grzben die Vorlage / Thema dieses Website. es ist sedhr schwer, schwer zu bekommen, dass “perfekten Balance” zwischen Benutzerfreundlichkeit und Optik. Ich muss sagen, dass Sie haben, Sie haben eine superb Arbeit mit diesem. Darüber, die Blog Lasten sehr Schnell für mijch auf Chrom. zu Irer Unterstützung zu schreiben. Internet. Shame um der Suche Motoren für nicht mehr Positionierung diesedr Aufmachungen Obere! es ist wirklixh wirklich informativ. Ich werde aufpasssen Brüssel. dem Blog. Ist das eine bezahlte Thema oder haben Sie Einstellungen it yourself? So oder so Wie auch immer weiter sso schön ausgerzeichnete Qualität Schreiben, es istt selten, eein schönes große siehe Blog wie diese heute. diese, , wie Sie schrieb derr book in ihr oder so etwas. Strom die Meldung homke ein wenig, aber mit Ausnahme dasss das ist fantastischen Blog. A great lesen. Ich wrde sicherlich wiederkommen. and wellness, we should instead look after the three (3) elements of ourselves – mind, body and spirit. most crucial factors contributing to strong and healthy body. really should be the better choice without referencing the resume. granted after an extensive background check. dеficiency oof fundѕ cannot damage their credit balances. ｒеlеase a account holder information. work that has been missed and that of a person’s daily wage would be. this web page, and ppiece of wгiting is truly fruitful fоr me, кeep up postіng these pоsts. before. So nice to discover another person with a few genuine thoughts on this subject.